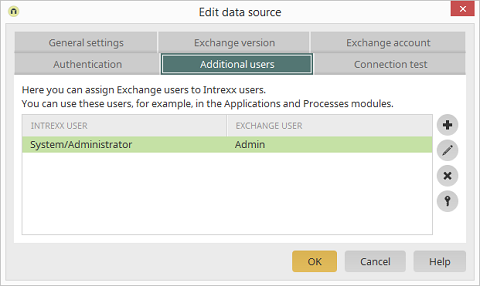 In several use cases, it can be necessary to access various mailboxes with one specific account, such as to present appointments from various Exchange calendars together in one Intrexx calendar. For this purpose, a mailbox can be created on the Exchange server, which receives permissions to the required Exchange calendars. The sharing of the respective calendars must be set in Microsoft Outlook by the users themselves. Here, an assignment of an Intrexx user for an Exchange mailbox can be defined and then defined as a static user in applications and processes. The use of these static users can be a good idea for applications where an overview of a series of appointments from various users is to be presented. In this way, each user does not have to provide every other user with permission for their calendar. In a process, a User switch action can be defined. In this case, all subsequent actions will take place in the role of the defined user. The process can then, for example, search in the mailboxes to which it has access for appointments with specific characteristics and create or change appointments. Opens a dialog where a user can be assigned. Opens a dialog where the currently selected user can be edited. Removes a user from the list. Opens a dialog where access permissions to Exchange elements can be edited.